2013-01-08 Assigned to PETRONA CONSULTING LIMITED LIABILITY COMPANY reassignment PETRONA CONSULTING LIMITED LIABILITY COMPANY ASSIGNMENT OF ASSIGNORS INTEREST (SEE DOCUMENT FOR DETAILS). Assignors: KIMBERLY-CLARK WORLDWIDE, INC.
Zinc-complex photoiniators and applications therefore are disclosed. 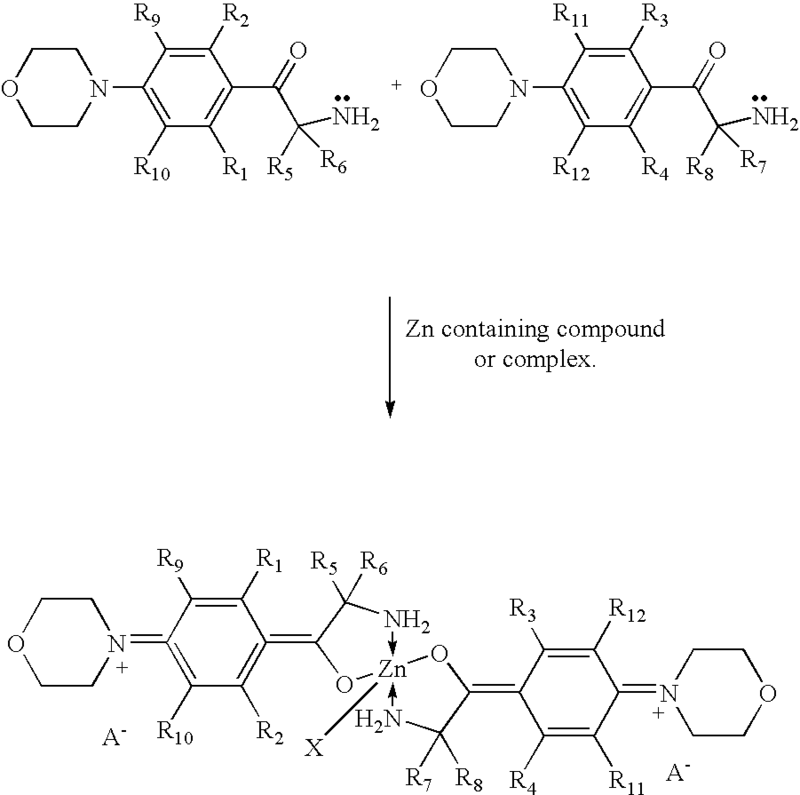 The zinc-complex photoinitiators of the present invention include various pendent groups which serve to protect the compound from hydrolysis. In this manner, the stability of the photoinitiator is increased. The photoinitiators of the present invention can be used in many different processes and applications. For example, the photoinitiators are well suited for use in photocurable inks as used in ink jet printers or on a printing press. wherein R 1, R2, R3 and R4 each independently represent hydrogen, an alkyl group having from one to six carbon atoms, an alkoxy group having from one to six carbon atoms, or a halogen-substituted alkyl group; R5, R6, R7 and R8 each independently represent an alkyl group having from one to six carbon atoms, an aryl group, or a halogen-substituted alkyl group having from one to six carbon atoms; wherein X represents (R17)2O or (R17)3N, wherein R17 represents H or an alkyl group having from one to eight carbon atoms; and wherein R9, R10, R11 and R12 comprise an alkyl group, an aryl group, a halo group, an alkoxy group or hydrogen and wherein at least one of Rg, R10, R11 and R12 comprises an alkyl, an aryl, a halo, or an alkoxy group. For many applications, at least one of R 9 or R10 and at least one of R11 or R12 above comprise an alkyl, an aryl, a halo, or an alkoxy group. By selecting particular “R” groups, photoinitiators are produced having a desired absorption maximum, which substantially corresponds to an emission band of a radiation source and selectively varies from less than about 290 nm to greater than about 350 nm. It has also been discovered that selecting particular “R” groups can further serve to increase the stability of the photoinitiators. wherein Y independently represents O, S, or O═C; wherein R 1, R2, R3 and R4 each independently represent hydrogen, an alkyl group having from one to six carbon atoms, an alkoxy group having from one to six carbon atoms, or a halogen-substituted alkyl group; R5, R6, R7 and R8 each independently represent an alkyl group having from one to six carbon atoms, an aryl group, or a halogen-substituted alkyl group having from one to six carbon atoms; wherein X represents (R17)2O or (R17)3N, wherein R17 represents H or an alkyl group having from one to eight carbon atoms; and wherein R9, R10, R11, R12, R13, R13′, R14, R14′, R15, R15′, R16, and R16′ comprise an alkyl group, an aryl group, a halo group, an alkoxy group, or hydrogen; R13′ R14′ R15′ and R16′ being the same or different from R13, R14, R15 and R16; and wherein at least one of R13, R14, R15 and R16 comprises an alkyl, an aryl, a halo, or an alkoxy group. In the above photoinitiator, for many applications, at least one of R 13 or R14 and at least one of R15 or R16 comprises an alkyl, an aryl, a halo, or an alkoxy group. In this embodiment, at least one of R9 or R10 and at least one of R11 or R12 may also comprise an alkyl, an aryl, a halo, or an alkoxy group. These and other features and advantages of the present invention will become apparent after a review of the following detailed description of the disclosed embodiments and the appended claims. wherein R 1, R2, R3 and R4 each independently represent hydrogen, an alkyl group having from one to six carbon atoms, an alkoxy group having from one to six carbon atoms, or a halogen-substituted alkyl group; R5, R6, R7 and R8 each independently represent an alkyl group having from one to six carbon atoms, an aryl group, or a halogen-substituted alkyl group having from one to six carbon atoms; wherein X represents (R17)2O or (R17)3N; and wherein R17 represents H or an alkyl group having from one to eight carbon atoms. wherein R 5, R6, R7, and R8 are as described above. wherein R 1, R2, R3 and R4 each independently represent hydrogen, an alkyl group having from one to six carbon atoms, an alkoxy group having from one to six carbon atoms, or a halogen-substituted alkyl group; R5, R6, R7 and R8 each independently represent an alkyl group having from one to six carbon atoms, an aryl group, or a halogen-substituted alkyl group having from one to six carbon atoms; wherein X represents (R17)2O or (R17)3N, wherein R17 represents H or an alkyl group having from one to eight carbon atoms; and wherein R9, R10, R11 and R12 comprise an alkyl group, an aryl group, a halo group, an alkoxy group or hydrogen and wherein at least one of R9, R10, R11, and R12 comprises an alkyl, an aryl, a halo, or an alkoxy group. For many applications, at least one of R 9 or R10 and at least one of R11, or R12 above comprises an alkyl, an aryl, a halo, or an alkoxy group. 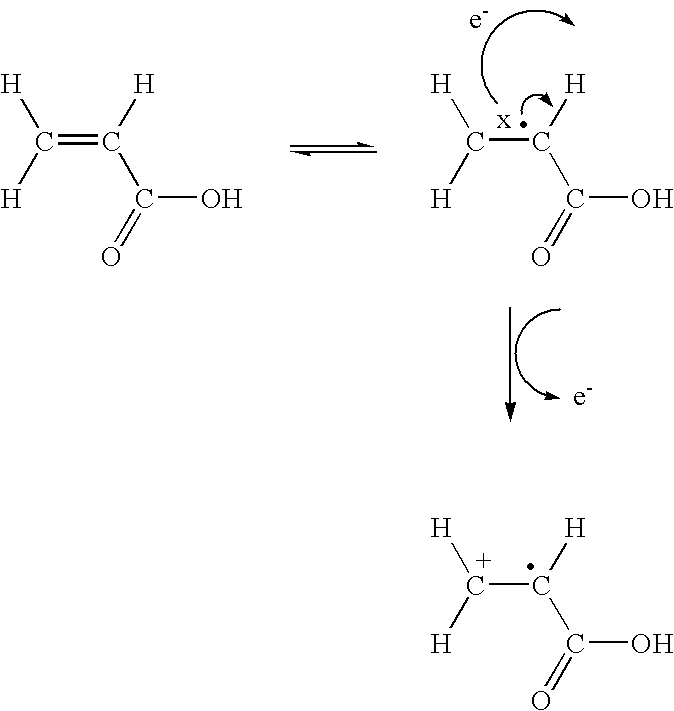 Halo groups that may be used in the present invention include a chloro group, such as chloride. It is believed that inclusion of the R 9, R10, R11, and R12 groups in the above compound may retard and inhibit hydrolytic attack. In particular, it is believed that the additional groups may serve to shield the compound from water molecules. For many applications, R 1, R2, R3 and R4 above are hydrogen. In this embodiment, R5, R6, R7 and R8 may be CH3 or, alternatively, Ph(CH2)2. In another alternative structure, R6 and R7 may be aryl groups. wherein Y independently represents O, S or O═C; wherein R 1, R2, R3 and R4 each independently represent hydrogen, an alkyl group having from one to six carbon atoms, an alkoxy group having from one to six carbon atoms, or a halogen-substituted alkyl group; R5, R6, R7 and R8 each independently represent an alkyl group having from one to six carbon atoms, an aryl group, or a halogen-substituted alkyl group having from one to six carbon atoms; wherein X represents (R17)2O or (R17)3N, wherein R17 represents H or an alkyl group having from one to eight carbon atoms; and wherein R9, R10, R11, R12, R13, R13 1, R14, R14 1, R15, R15′, R16, and R16′ comprise an alkyl group, an aryl group, a halo group, an alkoxy group, or hydrogen; R13′ R14′ R15′ and R16′ being the same or different from R13, R14, R15 and R16; and wherein at least one of R13, R14, R15 and R16 comprises an alkyl, an aryl, a halo, or an alkoxy group. As shown above, in this embodiment, the photoinitiator further includes groups R 13 through R16 and R13′ through R16′. These groups can be added in addition to R9 through R12 or can be added in lieu of the R9 to R12 groups. For many applications, at least one of R 13 or R14 and at least one of R15 or R16 comprises an alkyl, an aryl, a halo, or an alkoxy group. At least one of R9 or R10 and at least one of R11 or R12 may also comprise one of the above groups in this embodiment. 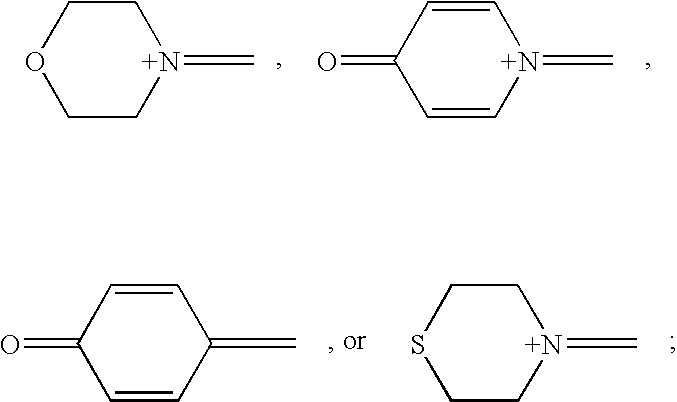 The above photoinitiator can also be associated with one or more anions (A −) as shown below. 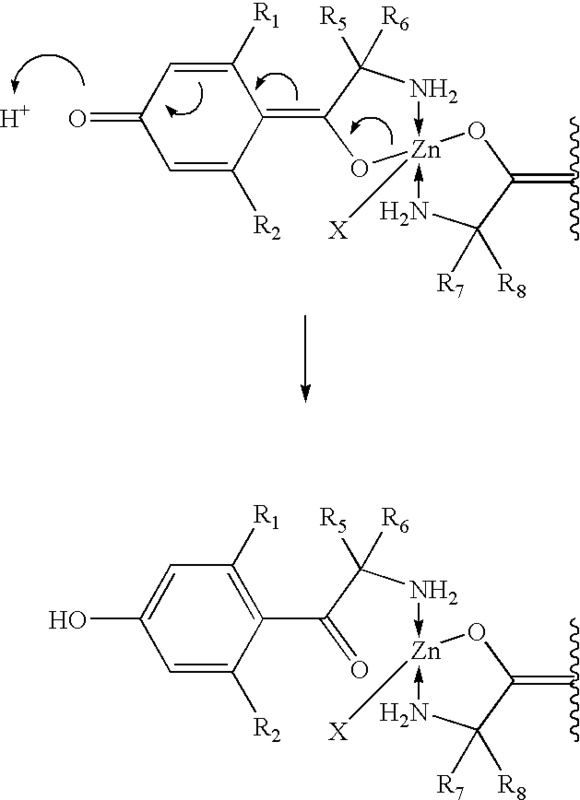 The above-described photoinitiators of the present invention may be produced by the following reaction mechanism, shown for when Z is NC 4H4O and for the embodiments above including R9 through R12. The resulting photoinitiators are relatively stable at room temperature (from about 15° C. to 25° C.) and normal room humidity (from about 5% to 60%; desirably from 5% to 30%). However, upon exposure to radiation at an appropriate wavelength, the photoinitiators efficiently produce one or more reactive species. The photoinitiators of the present invention have a high intensity of absorption. For example, the photoinitiators of the present invention have a molar extinction coefficient (absorptivity) greater than about 20,000 I mole −1 cm−1. As a further example, the photoinitiators of the present invention have a molar extinction coefficient greater than about 25,000 I mole−1 cm−1. wherein R1, R2, R3 and R4 each independently represent hydrogen, an alkyl group having from one to six carbon atoms, an alkoxy group having from one to six carbon atoms, or a halogen-substituted alkyl group; R5, R6, R7 and R8 each independently represent an alkyl group having from one to six carbon atoms, an aryl group, or a halogen-substituted alkyl group having from one to six carbon atoms; wherein X represents (R17)2O or (R17)3N, wherein R17 represents H or an alkyl group having from one to eight carbon atoms; and wherein R9, R10, R11, and R12 comprise an alkyl group, an aryl group, a halo group, an alkoxy group or hydrogen and wherein at least one of R9, R10, R11 and R12 comprises an alkyl, an aryl, a halo, or an alkoxy group. 2. The photoinitiator of claim 1, wherein at least R9 or R10 and at least R11 or R12 comprise an alkyl, an aryl, a halo, or an alkoxy group. 4. The photoinitiator of claim 3, wherein R5, R6, R7 and R8 are CH3. 5. The photoinitiator of claim 3, wherein R6 and R7 comprise an aryl group. 6. 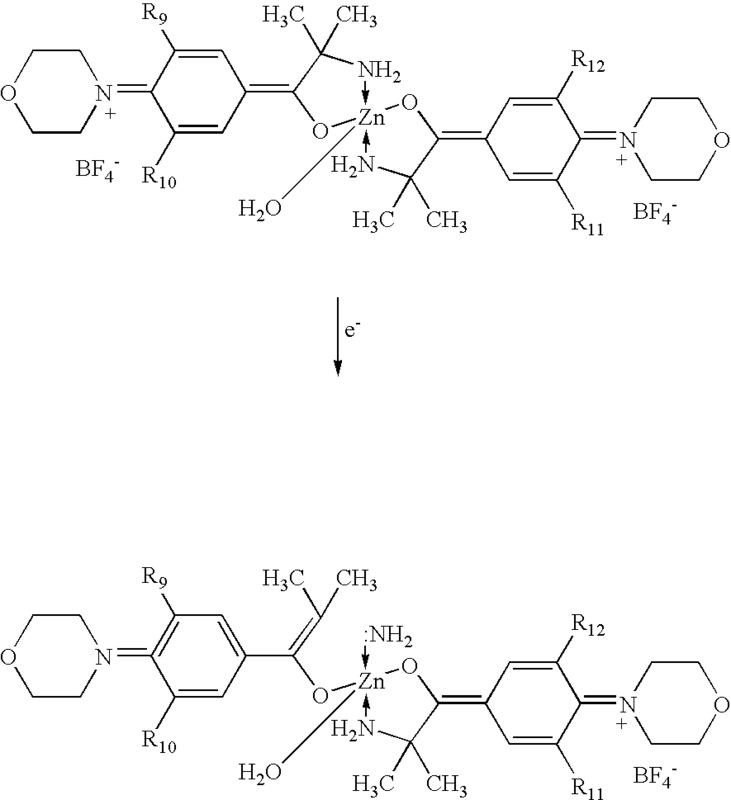 The photoinitiator of claim 3, wherein R5, R6, R7 and R8 are Ph(CH2)2. 7. The photoinitiator of claim 2, wherein the photoinitiator is associated with one or more counterions. 8. The photoinitiator of claim 7, wherein the one or more counterions comprise tetraphenylboron, tetrachloroboron, tetrafluoroboron, hexafluorophosphate, perchlorate, or a combination thereof. 9. The photoinitiator of claim 8, wherein the one or more counterions comprise tetraphenylboron or tetrafluoroboron. 10. The photoinitiator of claim 4, wherein the photoinitiator is associated with a counterion, the counterion comprising tetrafluoroboron. irradiating the photoinitiator of claim 2 with radiation. irradiating an admixture of a polymerizable material and the photoinitiator of claim 2.
wherein Y independently represents O, S, or O═C; wherein R1, R2, R3 and R4 each independently represent hydrogen, an alkyl group having from one to six carbon atoms, an alkoxy group having from one to six carbon atoms, or a halogen-substituted alkyl group; R5, R6, R7 and R8 each independently represent an alkyl group having from one to six carbon atoms, an aryl group, or a halogen-substituted alkyl group having from one to six carbon atoms; wherein X represents (R17)2O or (R17)3N, wherein R17 represents H or an alkyl group having from one to eight carbon atoms; and wherein R9, R10, R11, R12, R13′, R13′, R14, R14′, R15, R15′, R16, and R16′ comprise an alkyl group, an aryl group, a halo group, an alkoxy group, or hydrogen; R13′ R14′ R15′ and R16′ being the same or different from R13, R14, R15 and R16; and wherein at least one of R13, R14, R15 and R16 comprises an alkyl, an aryl, a halo, or an alkoxy group. 15. The photoinitiator of claim 14, wherein at least one of R13 or R14 and at least one of R15 or R16 comprises an alkyl, an aryl, a halo, or an alkoxy group. 16. The photoinitiator of claim 15, wherein at least one of R9 or R10 and at least one of R11 or R12 comprises an alkyl, an aryl, a halo, or an alkoxy group. 17. The photoinitiator of claim 16, wherein Y comprises O. 18. The photoinitiator of claim 17, wherein R1, R2, R3 and R4 are hydrogen and X is H2O. 19. The photoinitiator of claim 18, wherein R5, R6, R7 and R8 are CH3. 20. The photoinitiator of claim 18, wherein R6 and R7 comprise aryl groups. 21. The photoinitiator of claim 18, wherein R5, R6, R7 and R8 comprise Ph(CH2)2. 22. The photoinitiator of claim 16, wherein the photoinitiator is associated with one or more counterions. 23. The photoinitiator of claim 22, wherein the one or more counterions comprise tetraphenylboron, tetrachloroboron, tetrafluoroboron, hexafluorophosphate, perchlorate, or a combination thereof. 24. The photoinitiator of claim 22, wherein the one or more counterions comprise tetraphenylboron or tetrafluoroboron. irradiating the photoinitiator of claim 16 with radiation. irradiating an admixture of a polymerizable material and the photoinitiator of claim 16.
wherein R1, R2, R3 and R4 each independently represent hydrogen, an alkyl group having from one to six carbon atoms, an alkoxy group having from one to six carbon atoms, or a halogen-substituted alkyl group; R5, R6, R7 and R8 each independently represent an alkyl group having from one to six carbon atoms, an aryl group, or a halogen-substituted alkyl group having from one to six carbon atoms; wherein X represents (R17)2O or (R17)3N, wherein R17 represents H or an alkyl group having from one to eight carbon atoms; and wherein Rg, R10, R11 and R12 comprise an alkyl group, an aryl group, a halo group, an alkoxy group or hydrogen and wherein at least one of R9, R10, R11 and R12 comprises an alkyl, an aryl, a halo, or an alkoxy group. 28. The method of claim 27, wherein at least R9 or R10 and at least R11 or R12 comprise an alkyl, an aryl, a halo, or an alkoxy group. 30. The method of claim 29, wherein R5, R6, R7 and R8 are CH3. 31. The method of claim 29, wherein R6 and R7 comprise an aryl group. 32. The method of claim 29, wherein R5, R6, R7 and R8 are Ph(CH2)2. 33. The method of claim 28, wherein the photoinitiator is associated with one or more counterions. 34. The method of claim 33, wherein the one or more counterions comprise tetraphenylboron, tetrachloroboron, tetrafluoroboron, hexafluorophosphate, perchlorate, or a combination thereof. 35. The method of claim 34, wherein the one or more counterions comprise tetraphenylboron or tetrafluoroboron. 36. The method of claim 28, wherein the photoinitiator is associated with a counterion, the counterion comprising tetrafluoroboron. wherein Y independently represents O, S, or O═C; wherein R1, R2, R3 and R4 each independently represent hydrogen, an alkyl group having from one to six carbon atoms, an alkoxy group having from one to six carbon atoms, or a halogen-substituted alkyl group; R5, R6, R7 and R8 each independently represent an alkyl group having from one to six carbon atoms, an aryl group, or a halogen-substituted alkyl group having from one to six carbon atoms; wherein X represents (R17)2O or (R17)3N, wherein R17 represents H or an alkyl group having from one to eight carbon atoms; and wherein R9, R10, R11, R12, R13, R13′, R14, R14′, R15, R15′, R16, and R16′ comprise an alkyl group, an aryl group, a halo group, an alkoxy group, or hydrogen; R13′ R14′ R15′ and R16′ being the same or different from R13, R14, R15 and R16; and wherein at least one of R13, R14, R15 and R16 comprises an alkyl, an aryl, a halo, or an alkoxy group. 39. The method of claim 38, wherein at least one of R13 or R14 and at least one of R15 or R16 comprises an alkyl, an aryl, a halo, or an alkoxy group. 40. The method of claim 39, wherein at least one of R9 or R10 and at least one of R11 or R12 comprises an alkyl, an aryl, a halo, or an alkoxy group. 41. The method of claim 40, wherein Y comprises 0. 42. The method of claim 41, wherein R1, R2, R3 and R4 are hydrogen and X is H2O. 43. The method of claim 42, wherein R5, R6, R7 and R8 are CH3. 44. The method of claim 42, wherein R6 and R7 comprise aryl groups. 45. The method of claim 42, wherein R5, R6, R7 and R8 comprise Ph(CH2)2. 46. The method of claim 40, wherein the photoinitiator is associated with one or more counterions. 47. The method of claim 46, wherein the one or more counterions comprise tetraphenylboron, tetrachloroboron, tetrafluoroboron, hexafluorophosphate, perchlorate, or a combination thereof. 48. The method of claim 46, wherein the one or more counterions comprise tetraphenylboron or tetrafluoroboron. wherein R1, R2, R3 and R4 each independently represent hydrogen, an alkyl group having from one to six carbon atoms, an alkoxy group having from one to six carbon atoms, or a halogen-substituted alkyl group; R5, R6, R7 and R8 each independently represent an alkyl group having from one to six carbon atoms, an aryl group, or a halogen-substituted alkyl group having from one to six carbon atoms; wherein X represents (R17)2O or (R17)3N, wherein R17 represents H or an alkyl group having from one to eight carbon atoms; and wherein R9, R10, R11 and R12 comprise an alkyl group, an aryl group, a halo group, an alkoxy group or hydrogen and wherein at least one of Rg, R10, R11 and R12 comprises an alkyl, an aryl, a halo, or an alkoxy group. 50. The photoreactive composition of claim 49, wherein at least R9 or R10 and R11 or R12 comprise an alkyl, an aryl, a halo, or an alkoxy group. 52. The photoreactive composition of claim 51, wherein R5, R6, R7 and R8 are CH3. 53 The photoreactive composition of claim 51, wherein R6 and R7 comprise an aryl group. 54. The photoreactive composition claim 51, wherein R5, R6, R7 and R8 are Ph(CH2)2. 56. The photoreactive composition of claim 50, wherein the at least one counterion comprises tetraphenylboron, tetrachloroboron, tetrafluoroboron, hexafluorophosphate, perchlorate, or a combination thereof. 57. The photoreactive composition of claim 52, wherein the counterion comprises tetrafluoroboron. wherein Y independently represents O, S, or O═C; wherein R1, R2, R3 and R4 each independently represent hydrogen, an alkyl group having from one to six carbon atoms, an alkoxy group having from one to six carbon atoms, or a halogen-substituted alkyl group; R5, R6, R7 and R8 each independently represent an alkyl group having from one to six carbon atoms, an aryl group, or a halogen-substituted alkyl group having from one to six carbon atoms; wherein X represents (R17)2O or (R17)3N, wherein R17 represents H or an alkyl group having from one to eight carbon atoms; and wherein R9, R10, R11, R12, R13, R13′, R14, R14′, R15, R15′, R16, and R16′ comprise an alkyl group, an aryl group, a halo group, an alkoxy group, or hydrogen; R13′ R14′ R15′ and R16′ being the same or different from R13, R14, R15 and R16; wherein at least one of R13, R14, R15 and R16 comprises an alkyl, an aryl, a halo, or an alkoxy group; and A− comprises a counterion. 59. The photoreactive composition of claim 58, wherein at least one of R13 or R14 and at least one of R15 or R16 comprises an alkyl, an aryl, a halo, or an alkoxy group. 60. The photoreactive composition of claim 59, wherein at least one of R9 or R10 and at least one of R11 or R12 comprises an alkyl, an aryl, a halo, or an alkoxy group. 61. The photoreactive composition of claim 60, wherein Y comprises O. 62. The photoreactive composition of claim 61, wherein R1, R2, R3 and R4 are hydrogen and X is H2O. 63. The photoreactive composition of claim 62, wherein R5, R6, R7 and R8 are CH3. 64. The photoreactive composition of claim 62, wherein R6 and R7 comprise aryl groups. 65. The photoreactive composition of claim 62, wherein R5, R6, R7 and R8 comprise Ph(CH2)2. 66. The photoreactive composition of claim 60, wherein the at least one counterion comprises tetraphenylboron, tetrachloroboron, tetrafluoroboron, hexafluorophosphate, perchlorate, or a combination thereof. MXPA03011380 MXPA03011380A (en) 2002-12-20 2003-12-09 Stabilized photoinitiators and applications thereof. ES2093562B1 (en) * 1995-05-26 1997-07-01 Univ Santiago Compostela Stabilization of colloidal systems by formation of lipid-polysaccharide ionic complexes. BE1006011A4 (en) 1994-04-19 OXIDE-ALKYL BIS-ACYL-PHOSPHINES AND THEIR APPLICATION AS FOR PHOTO-CURING IGNITORS COMPOUNDS ethylene. ES2208250T3 (en) 2004-06-16 New systems phosphine oxide photoinitiators crosslinkable compositions and low color. ES2254942T3 (en) 2006-06-16 Process for the production of strongly adherent coatings.